[Nieuw] Stereo Tool 7.40 (24-12-2013) - Radio-streams, informatie en verkoop audio streaming pakketten. Declipper: Fixed several bugs (reported by Leif Claesson), output sounds better. AGC: Added “Power Bass” mode. Makes deep bass far more constant and stronger (feedback from Wouter Tietema and Jeff Prins). AGC: Release did not respond the same at very high input levels. Old behavior still present for compatibility. AGC: Audio level was more consistent at lower latency settings. Same consistency now also for high latency. 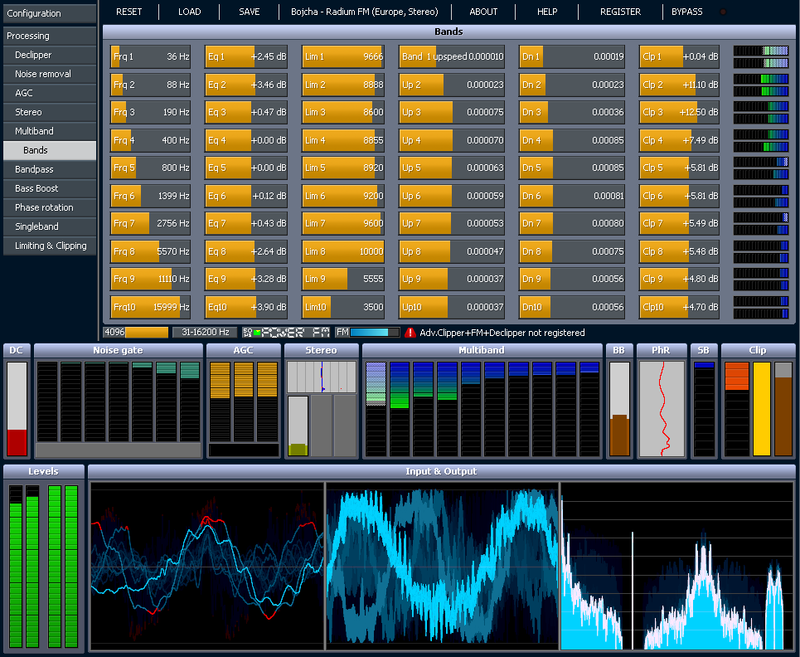 Compressor/Limiter: Improved and optimized code for compressors, limiters and Natural Dynamics. Compressors: Added Continuous Release mode for compressors. Limiters: Improved limiter attack and release behavior. Much tighter, far less pumping. FM: Replaced Multipath Clipper by something that works better and affects the audio less. Feedback wanted! Stand alone version: Added option to receiving a stream via VLC (must be installed). Stand alone version: FM: Added FM transmitter synchronization to stand alone version. FM: BS412: Memory and CPU usage reduced. FM: Rewrote Stokkemask code and added some options to control behavior and CPU load. Advanced Clipper: Added Controlled Distortion, including intermodulation distortion detection. Command line version –samplerate option to use different sample rates. Allows outputting MPX. Command line version –r128 option for R128 normalization. Sound cards: Added hysterisis when changing buffer size to avoid Juli@ ASIO driver crashes. Sound cards: Auto-restart in case of driver errors. Sound cards: Join input sound cards for Rockland/Radio SAW (stations with normal and regional content). GUI: Metering: Added scales to meters. GUI: Metering: MPX power added. GUI: RDS: Use RDBS PTY names when using 75 us pre-emphasis. GUI: Added full screen mode; hides all window bars and Windows task bar. GUI: Added zooming in/out to waveform displays, optimized code, made it possible to turn the display off. GUI: Added warning when closing. GUI: Moved Phase Shaping to under Phase Rotator (since it’s hardly used or useful). GUI: CPU load for moving mouse over Bands or Equalizer displays greatly reduced. GUI: Improved multi-touch screen handling. GUI: Renamed some Natural Dynamics settings for clarity. GML Plugin: GUI: Removed new version notification from GML plugin. GML Plugin: Added R128 normalization. Bug fix: Compressors did not handle audio with more than 2 channels properly. Updated existing built-in presets to run with the new RMS mode.